ePub Version The ADA standards of care for pregnant women with preexisting diabetes. Click here to learn more about eBooks from Shopdiabetes.org. Offers a single resource for American Diabetes Association standards of care for pregnant women with preexisting diabetes - type 1 (DM1) or type 2 (DM2). 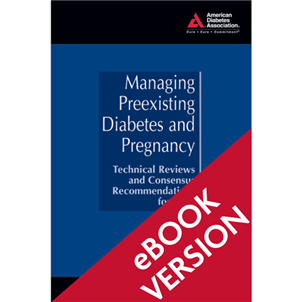 It providers up-to-date recommendations and treatment protocols for the management of diabetes and pregnancy to researchers, academic physicians, and clinicians who deal with the broad spectrum of problems.